Moon Man Koopa's spaceship is a large, red colored spaceship owned and piloted by Moon Man Koopa in The Super Mario Bros. Super Show! In The Super Mario Bros. Super Show! episode "Stars in Their Eyes", Moon Man Koopa's Spaceship is, at first, only briefly seen in a hangar in Moon Man Koopa's Quirk Factory. Later in "Stars in Their Eyes", Moon Man Koopa, after failing to capture Mario, Luigi, Toad and Princess Toadstool, who had escaped his Quirk Factory, begins to chase them in his ship as they trie to flee in theirs. Chasing Mario, Luigi, Toad and Princess Toadstool through space, Moon Man Koopa begins to attack and tries to grab them with his ship. After a long battle against Mario, Luigi, Toad and Princess Toadstool, Moon Man Koopa's Spaceship is damaged when a large amount of pasta, dumped from Mario's spaceship, falls into it. With the spaghetti causing his ship to become slow and malfunction, Moon Man Koopa tries to land on Quirk; only to have his ship become even more damaged by the Quirks, who, rebelling against Moon Man Koopa, hum loud enough to damage his ship internally. With his ship severely damaged, Moon Man Koopa is forced to retreat, with his ship sparking dangerously and its front window cracking. Moon Man Koopa's spaceship has a minor resemblance to the head of an Albatoss, with the ship's "beak" being capable of opening an closing. 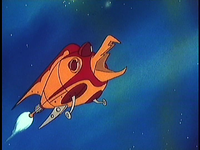 Seemingly concealed in the beak of his ship was a projectile launching device, which could fire flaming meteors at enemies; mounted on the side of Moon Man Koopa's Spaceship were two additional, meteor launching cannons. This page was last edited on January 29, 2019, at 12:46.